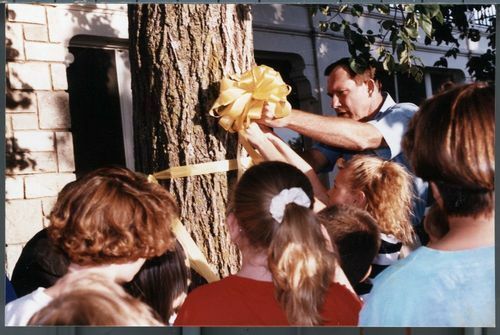 A photograph showing Kansas Governor Mike Hayden placing a yellow ribbon around a tree at Cedar Crest demonstrating support for Kansas National Guard troops deployed to the Persian Gulf for Operation Desert Storm. Born in Atwood, Kansas, Hayden entered politics after a decorated career in the military serving in Vietnam. During his political career, Hayden held multiple offices from 1962 forward. Hayden returned to Kansas after pursuing politics in Washington, D. C. in 2002, as the Secretary of Wildlife and Parks.